The time that birders have awaited since the lonely, frigid days of winter is now upon us. With May comes the peak of spring migration as long‑distance migrants pour into the Kawarthas from the neo‑tropics ‑ Mexico, Central America, the West Indies and South America. In Peterborough County alone, a day of birding in mid-May can produce over 100 different species. Not only do their flamboyant colours symbolize the tropical habitats whence they’ve come, but their vigorous singing heralds that high spring is finally here. An elegant synchronicity of events is happening before our eyes. As the green canopy of leaves develops overhead, countless caterpillars emerge to feast on the verdant bounty laid out before them. And, right on cue, hundreds of millions of birds arrive to regale themselves of this insect banquet. 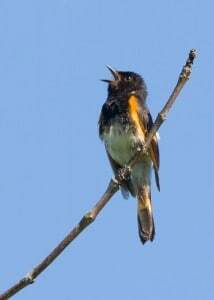 While some species remain to nest in the Kawarthas, others are only passing through on their northward journey and won’t be seen again until their flight south in the fall. You may wonder why an eight inch, two-ounce bird like a rose-breasted grosbeak would risk a perilous 4000 km journey from Costa Rica all the way to Kawarthas just to nest? Obviously, there must be compelling reasons. The short answer is that they are able to raise more young than had they remained in the tropics. Protein‑rich insects are abundant during the Canadian spring and summer; there is a much larger geographical area over which to spread; and the long days allow birds to feed their young more than four hours longer than had they remained in the south. May’s bounty of birds can be enjoyed right here in Peterborough, especially if you have tree cover on your property and an offering of sunflower seeds and sugar water. 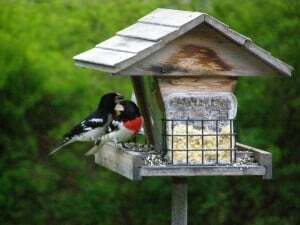 Early May sees the arrival of ruby-throated hummingbirds, Baltimore orioles and rose-breasted grosbeak, all of which will come to feeders. House wrens, too, are arriving from the tropics and are easy to attract to nest boxes. In the downtown, watch and listen for swallow-like chimney swifts coursing above George Street like chattering “flying cigars”. By mid-month, an indigo bunting may also make a guest appearance at your feeder – an unforgettable sight in its radiant blue plumage. Watch and listen too for up to 16 species of warblers, many of which put in a brief appearance in city backyards. Decked out mostly in yellows, oranges, whites and blacks, warblers are the true gems of spring migration. 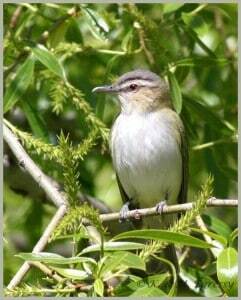 Bringing up the rear, late May ushers in species such as the red-eyed vireo, which have flown all the way from the Amazon Basin. If you live in a part of the city with mature trees, listen for the vireo’s repetitive, robin-like song as it forages high in the treetops. If you want to take in the entire migration spectacle, however, you will need to be out looking and listening almost every day, especially when the weather is damp and mild. Bird activity is usually most intense in the morning between about 6 and 9 a.m. Song is the key to the birds’ presence, so it’s important to pay attention to the different voices. Warblers, for example, tend to have high-pitched, buzzy songs, while birds like scarlet tanagers, orioles and grosbeaks sing in rich, musical notes. The good news is that many May migrants show up in loose, mixed-species flocks. If you find one variety of warbler, for example, other species are probably nearby as well. Pishing will often bring them in closer for great views. Although migrants can turn up anywhere, some habitats and specific locations are consistently better than others. Habitat edges are most productive, including wooded roadsides, the trees along rail-trails, hedgerows, and the shrubby borders of wetlands. 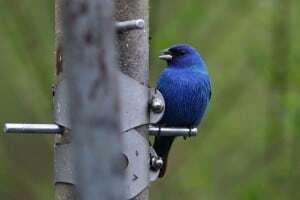 Among my favorite places for spring birding are Herkimer Point Road (east of County Road 31 in Hiawatha), Beavermead Park and Ecology Park on Little Lake, Jackson Park, the Rotary-Greenway Trail (especially the Promise Rock section north of the science complex at Trent University), Lynch’s Rock Road and Sawer Creek Wetland (northeast of Lakefield), Hubble Road (east of County Road 44, north of Havelock), Petroglyphs Provincial Park and Sandy Lake Road (east of County Road 46, just south of Lasswade). Flying at an elevation of about 1000 metres, most songbirds migrate at night, which allows them to see the stars for navigation purposes and to avoid predators such as hawks. It is quite common to hear their contact calls as they pass overhead in the inky darkness. Songbirds almost always wait for a tail wind – a wind blowing in the same direction they are headed – before migrating in large numbers. A tail wind allows the birds to expend less energy in flight. In the spring, tail winds are associated with warm fronts advancing from the south or southeast. However, a sustained south winds may cause birds to fly right over your favorite birding destination without stopping. The key to great May birding is to watch the local forecast for some change in the weather such as a forecast of rain and fog. When a northward-moving warm front collides with a cold front, the warm air ‑ and the birds flying in it ‑ rises over the cold. The air cools, rain develops and the birds are forced to land in what is called a “fallout”- sometimes right in your own backyard! This means that rainy mornings in May can produce superb birding, especially when the precipitation is light and starts after midnight. During spring fallouts, I’ve seen trees hopping with dozens of warblers of ten or more species. To the practiced ear, a chorus of bird song is like a symphony in which you recognize each of the individual instruments. As a beginner, though, you should learn to focus on one song at a time and not the entire symphony, which can be quite overwhelming. Focus your attention first on the closest, loudest and most obvious songs. You can then move on to the softer voices. Cupping your ears can be very helpful. There is no doubt that some species sound similar to others. However, when you take into consideration the context of the song ‑ habitat, time of year and the bird’s behaviour ‑ the choice usually comes down to only a handful of species. It is also crucial to learn the memory-aids or “mnemonics” for the songs. To me, a rose-breasted grosbeak sounds like a robin that has taken voice lessons, while a scarlet tanager is reminiscent of a robin with a soar throat! Go to fernbank.edu/Birding/mnemonics.htm for a great list. My favorite bird song app is the Sibley eGuide to Birds. Allaboutbirds.org is another superb resource. Being able to recognize bird song is one of the most satisfying ways to enjoy nature. To step out the back door or walk down a forest trail on a May morning and hear the expected birds singing in the expected locations provides reassurance that the bird community is healthy, and the seasonal rhythms of the natural world are occurring, as they should.